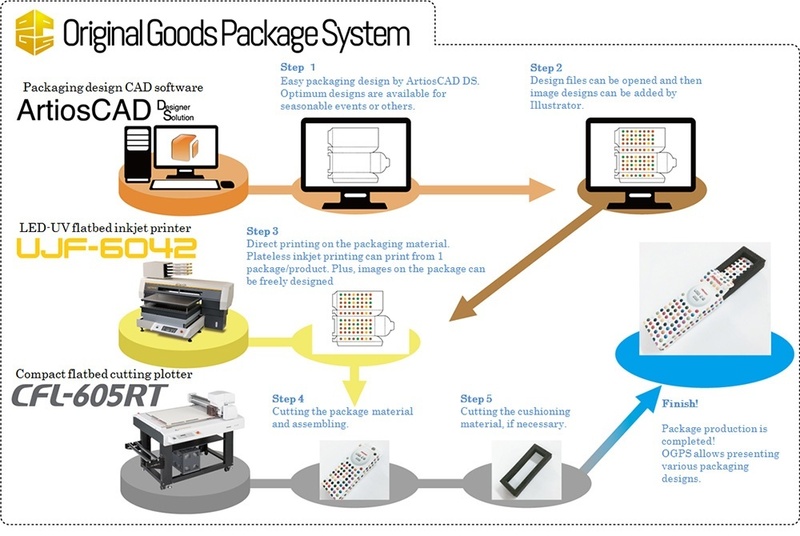 Mimaki Engineering Co., Ltd., a global industry leader and manufacturer of wide-format inkjet printers and cutting plotters, announced today the July 2015 launch of the packaging design CAD software called ArtiosCAD Designer Solution (ArtiosCAD DS). ArtiosCAD DS is a dedicated CAD software of the Mimaki product line and is based on *1ESKO’s ArtiosCAD. Digital on-demand UV inkjet printing is being increasingly used to create original and customized goods in response to the increase in high-mix low-volume market demand for original goods business shops (*2OGBS). Accordingly, the demand for packaging design and production for customized goods has also increased; however, packaging design and manufacturing require professional packaging design knowledge and skills to operate complex software. The new ArtiosCAD DS comes with more than 400 package design templates. Users will be able to select their preferred template; enter the appropriate width, length, and depth; and automatically create a custom design with appropriate cutoffs and creasing lines. *3The created file can be opened in Illustrator to add images for decorative printing. Mimaki offers the original goods package system (OGPS) as complete solution for on-demand customized goods production. OGPS consists of the ArtiosCAD Designer Solution, the LED UV inkjet printer UJF-6042, and the CFL-605RT compact flatbed cutting plotter and performs the handling of the entire production process, including printing, packaging design, and fabrication. *1: Esko is headquartered in Ghent, Belgium and is a global supplier of integrated solutions for packaging and labeling, sign and display, and commercial printing and publishing industries. *2: OGBS means business that creates personalized items on order. A range of products such as cards, seals, and many other items are personalized by printing or other methods. *3: To enable this function, please download the free plug-in “Esko Data Exchange” from Esko’s website. ArtiosCAD is the most widely used packaging design CAD software. The dedicated Mimaki version “ArtiosCAD DS” consists of selected functions from ArtiosCAD and 400 packaging design templates. 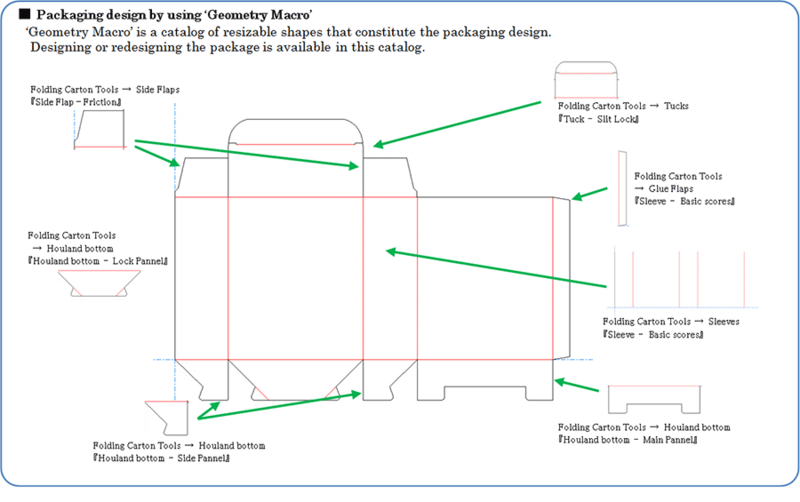 ・A package is designed by selecting a suitable design from 400 templates and then entering the thickness of the packaging material and dimensions (length, width, and depth) by following the directions on the display. Use in combination with CFL-605RT and UJF-6042 delivers the complete original goods packaging production process, including printing on goods, packaging design and manufacturing, and cutting of cushioning material. ●Step 2: Enter the thickness of the packaging material on the “Single-Design Setting” window. ●Finish: A diagram is displayed when the package design is completed. The created packaging design file can be opened in Illustrator to add images for decorative printing after installing the free plug-in “Esko Data Exchange,” which can be downloaded from the Esko website. The packaging design is completely finished after adding a graphical design. A range of guide functions assist to design packaging diagrams without using the templates. Here are several useful tools. OGPS reduces the time spent on the process of making a prototype package. Conventionally, there were many work processes to create the package that suits a product. You would ask an outside contractor to create the package, and it would take a long time to complete the work because of misunderstandings, distance, time differences, etc. OGPS consists of the CFL-605RT, the ArtiosCAD DS, and the UJF-6042 inkjet printer. The system offers a total solution not only for printing on a product but also for the design and creation of product/cushion packaging. OGPS delivers effective high-mix low-volume production and significantly shortens the lead time for prototype creation and small lot production by on-demand fabrication. The easy-to-use ArtiosCAD DS software allows designers to create packages fast and offer various packaging designs to match seasons or events. The LED UV flatbed inkjet printer is capable of printing on an object up to A2 size. The UJF-6042 is applicable to printing on a product as well as on the package materials. The CFL-605RT compact flatbed cutting plotter is designed with Mimaki’s well-established technology and delivers efficient sample and package production. The CFL-605RT is capable of cutting packages and cushioning materials, as well as creasing. *2: Other languages are available by downloading.